Many scientific investigations deal with huge data sets, running tests on large numbers of samples to gain statistically-meaningful results. Imaging is a potential bottleneck in these studies; microscopy, in particular, can be time-consuming and tiring for the human eye. There is also a degree of subjectivity involved in human analysis of microscope slides; even an experienced technician’s capacity to evaluate the images will waver after several hours of visual analysis. Automated image analysis techniques can increase throughput of samples and standardise test results. The Preclinical Safety Unit at pharmaceutical company Novartis is concerned with assessing the safety of potential drug candidates prior to administration to humans. Dr Wilfried Frieauff, laboratory head within the genetic toxicology unit in preclinical safety at Novartis in Basel, Switzerland, has developed ROBIAS (ROBotic Image Analysis System) for automated image analysis of samples. The system uses a Sony CCD colour camera, mounted to a fully automated Leica microscope, and custom-developed image algorithms based on the Matrox Imaging Library (MIL). Toxicologists make assessments on the negative aspects of a drug candidate, which could potentially cause side-effects. A range of in vitro and in vivo assays are carried out to determine any deleterious effects of the compound. Part of the work undertaken by the preclinical safety unit involves conducting various genetic toxicology assays relying on images to provide quantifiable data on the genotoxicity (deleterious effect on genetic material) of the compound. Substances that interact with the genetic material can potentially be mutagenic or carcinogenic. In vitro and in vivo micronucleus tests, comet assay, and chromosome aberration analysis are all tests used to identify the extent of genetic damage caused by the drug candidate under investigation, and each can be handled by ROBIAS. The micronucleus test looks at chromosomal damage during cell division, whereas the comet assay assesses the direct action of the drug candidate on nuclear DNA. ‘The assays in isolation are not sufficient to tell the scientist whether the compound is safe or not but, by combining numerous tests looking at different possible aspects of how the drug candidate will affect the cell or the whole organism, potential side-effects can be identified,’ explains Frieauff. The majority of the range of assays required cannot be addressed by automated image analysis techniques, but ROBIAS was designed to automate as many of the assays conducted routinely at the preclinical safety unit as possible. ‘Hundreds of studies for a variety of toxicological tests are run annually in genetic toxicology at Novartis, and automated image analysis is vital to ensure accurate and standardised test results,’ states Frieauff. MIL formed the basis of the image analysis algorithms Frieauff developed on the ROBIAS platform. ‘The number and variance of measured features used for pattern recognition algorithms will be a lot higher for biological image analysis than for an industrial environment,’ comments Frieauff. In an industrial environment there is generally greater prior knowledge about the patterns under consideration (such as CAD features) and the deviation from a standard prototype model can be better estimated. Frieauff uses the micronucleus assay as an example: ‘The micronucleus assay is dealing with cells each showing individual visual characteristics (shape, size, spectral features) that may well alter from image to image and sample to sample.’ In addition, other variables such as the age of cells in culture, or the batch of dye used to stain the nuclear material will differ from test to test, and there is also potential human error during laboratory work. Image analysis for micronucleus detection starts off with the segmentation of thousands of potential candidates; there will be stained particles, debris and fragmented nuclear material that may mimic the criteria designated to identify micronuclei. ‘The pattern matching algorithm has to distinguish between the micronuclei and all these artefacts,’ explains Frieauff. The micronucleus test looks at looks at chromosomal damage during cell division. The areas in red are micronuclei and signify damaged genetic material. Image courtesy of Novartis. Cell counts are an important part of many scientific research projects, as quantitative analysis is used in statistical evaluations. Glance Vision Technologies, a company based in Trieste, Italy, specialising in developing advanced computer vision solutions, has developed eCELLence – a software tool for counting and classifying cells. The software incorporates 3D analysis capability, which allows cell counts to be made through different cell layers, as is the case when using confocal microscopy. Walter Vanzella, project manager at Glance Vision Technologies, notes that when it comes to manual image analysis, even among experts, there could be significant differences in recognition – especially with difficult images such as when objects overlap. He says that it is simply not possible to guarantee an accurate count using manual techniques, because there are no common criteria for analysis. eCELLence is currently being used in the department of neuroscience of Italian university SISSA, where researchers are looking to distinguish between live and dead cells based on nuclear morphology. The Mediterranean Institute of Biology in Marseille, France, is also using eCELLence in confocal microscopy to count neurons on neural networks. Vanzella identifies one difference between biological and industrial image analysis: speed. In industrial applications, speed is often crucial and analysis times are short. ‘In biology, the quality of the evaluation is more important and more time is available. This means that a different kind of algorithm and strategies can be adopted,’ he says. An industrial environment is highly controlled and various factors are employed to ensure edge detection is reliable. ‘In biology this is more difficult,’ notes Vanzella. The same concept of edge is more vague and other mathematical formulae are more suitable for object recognition. Image analysis software tool, eCELLence, is designed for counting and classifying cells. Image courtesy of Glance Vision Technologies. Enhanced image analysis algorithms have improved the standardisation and efficiency of biological image analysis. However, there are many applications, utilising fluorescence for example, where the camera hardware is important. A research group led by Dr Pierre Desbiolles at Laboratoire Kastler Brossel, CNRS and Université Pierre et Marie Curie, Paris, have been using fl uorescence microscopy to investigate how the EcoRV protein – a restriction enzyme – acts on and modifies DNA. Restriction enzymes are proteins that copy or edit DNA sequences, and the main mechanism for identifying targeted DNA base pairs is believed to be ‘sliding’. This is where the protein moves linearly in one dimension along the DNA strand. However, recent research has suggested that proteins can also move along the DNA strand in three dimensions by ‘hopping’ or ‘jumping’. The research project aimed to observe, for the first time, the sliding and jumping of EcoRV by using an experimental system whereby individual enzyme molecules can be visualised with fluorescent Cy3 labels. ‘Speed and sensitivity are often mutually exclusive in a camera because, to gather enough light from fluorescing molecules for single molecule detection, the exposure time needs to be longer,’ explains Desbiolles. 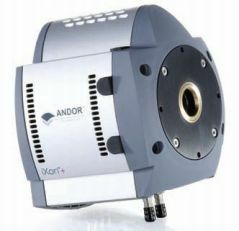 The project utilised the iXonEM+ 860 back-illuminated EMCCD camera from Belfast-based Andor Technology, a provider of high-value scientific digital cameras. The iXonEM+ 860 operates at a frame rate of 500fps. Slow 1D diffusion of the enzyme had to be distinguished from 3D translocation (hopping/jumping), which is several orders of magnitude faster. Desbiolles explains that a camera with an exposure time of milliseconds was required to detect the length and frequency of jumps. ‘It also needed to be sensitive enough to identify individual fluorescent Cy3 labels,’ he says. Desbiolles comments that the work improves understanding of how bacteria protect themselves against viral attack. Scientific and research applications clearly present very different imaging challenges to those faced in traditional machine vision markets. The resolution of objects viewed down a microscope depends on the wavelength of light used. Electron microscopes utilise electrons to illuminate the sample, which have a much shorter wavelength than visible light. Therefore the resolving power and, in turn, magnification is greater. X-ray microscopy uses electromagnetic radiation in the soft X-ray band and lies between optical and electron microscopy in terms of resolving power. The Fraunhofer Institute for Laser Technology ILT in Aachen has developed a powerful light source for compact X-ray microscopes. The group is part of a joint project lead by Accel Instruments, an instrumentation company based in Germany, which is aiming to bring compact X-ray microscopes onto the market. The group’s task was to optimise the use of short wavelength radiation as well as operating the source at a high power level to achieve sufficient high photon flux and bring exposure times down to an acceptable level. Soft X-ray microscopy makes use of a natural contrast between water and carbon when examining biological specimens. Radiation with wavelength 2.4-4.4nm is strongly absorbed by carbon, but has a high transmission for water and oxygen. The team hope to integrate the source/collector module into a first prototype of a compact X-ray microscope, which will allow for 3D cell imaging.